For solar white light imaging and white light visual observing. The Lunt White Light Wedges come with a built in ND3 filter. Notably, this allows perfectly safe imaging or visual observing of the Sun. Alternatively, if you wish to do visual observing we recommend dimming the image for your eyes with a Polarizing Filter. 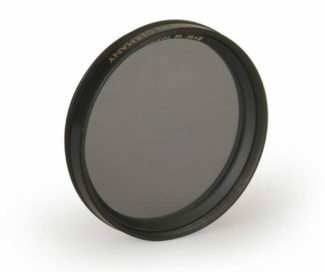 First put one Polarizing Filter on the bottom of your eyepiece. Then adjust the brightness to your comfort by rotating the eyepiece. We offer 2 sizes of White Light Wedges. The 2” version allows for 2” eyepieces and has a 2” barrel for the focuser, and the 1.25” version allows for 1.25” eyepieces and has a 1.25” barrel. The 2″ model performs best on refractors with apertures of 6” or less. The 1.25″ model performs best on refractors up to 4″ in aperture. As long as you can reach focus for imaging with a standard star diagonal on your night time telescope, you will be able to reach focus when imaging with Lunt White Light Solar Wedges. I use the 1.25 version with my trusty old TeleVue Genesis 100mm f/5. I had found that glass and film filters have terrible wavefront – hence poor resolution. The Lunt Wedge provides wonderful res both visually and for imagery (using the Lunt Solar Camera). At f/5 this combo comfortably captures the entire solar disc. With a 2x barlow I get great detail on sun spots and even granulation. For visual I use the Lunt Zoom eyepiece + single polarizer rotated for max extinction. For CCD I use a 13% ND in series with a Zumell #56 Green at f/5 and go to 25% ND at f/10. The green filter is to block residual chromatic /NIR of the APO refractor. Used in this way the resolution is wonderful and exposures are very short. Although the Genesis incorporates an aft refractive cluster, no damage has occurred aiming it at the sun for hundreds of imaging sessions. The site reviews and product examples here made the solar wedge an easy buy for me. Saving my pennies to get an H-alpha setup some day, but for now this is perfect. This is an extremely well made instrument that makes solar observing in white-light a new experience. My recent comparisons with high-end films and glass filters have proven to me that solar detail through the wedge is superior. I was concerned about heat issues, but when observing with a 4″ refractor for an hour or more, the red disk never became too hot for comfort. The Lunt Herschel Wedge has brought quality sunspot observing back into my daily routine.